The project is aimed to show people in China what air pollution is like every day in China against what government claims. 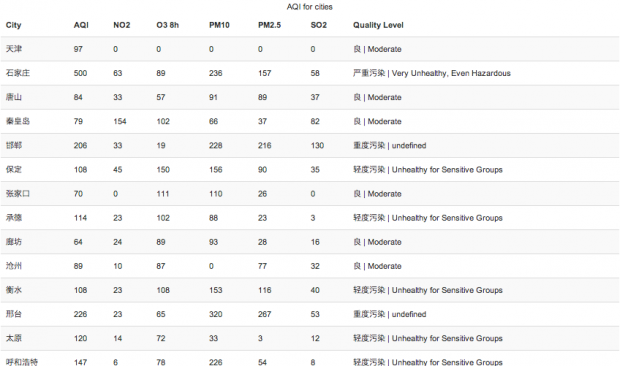 The project demonstrates realtime visualization of air quality in major cities in China and divided by air pollutants. Data sources are from PM25.in by Bestapp.us. They converged data from diverse platforms, such as US Embassy in Beijing, EPA, Ministry of Environmental Protection of China, etc. The project is hosted here on Heroku. An astounishing sand storm happened this spring in Beijing and devoured everything in sight. The PM2.5 reaches beyond range of certain standards for air quality measurement to 516, in which the highest measuable value is 500. What is more astonishing is that government was trying to conceal real number of these important data. They even critized foreign news agencies and government departments of spreading “fake news” to China’s public. Of course, in this campaign, the government lost all of its trust from people. However, that is not enough. The public have the right to know real data, and key data with relation to life and death of people should be spread freely. 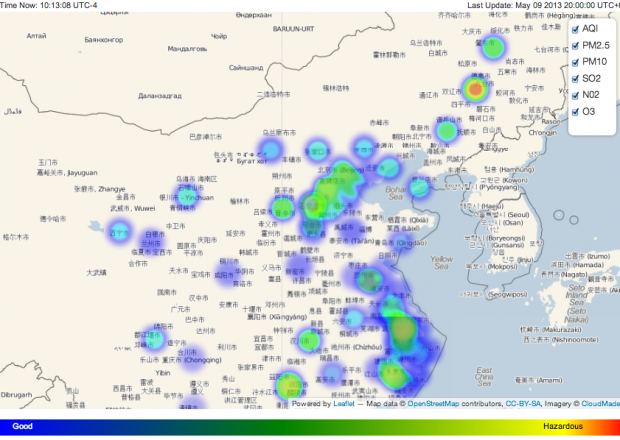 Thanks to BestApp.us lab in Guangzhou, China, I am allowed to launch this project to collect air quality data of 76 major cities in China and provide a better way of visualizing air quality data in China and spread it to more people in China. Data sources of this project are merged by BestApp lab. The are specifically collected from US Embassy in Beijing, EPA and Department of Environment of China, etc. Data could be with come flaws within a certain level. A pressure should be always on the shoulder of government why air pollution is so severe and how much economic growth did cost in the past 30 years. Map visualization is zoomable. All visualization can be viewed based on different air pollutants. There is also a table for people who wants to know specific data for cities.